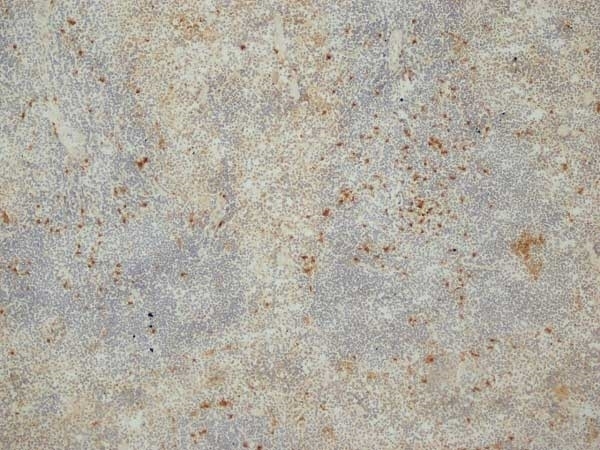 Rat anti Mouse Siglec-H antibody, clone 440c recognizes the cell surface receptor Siglec-H, a sialic acid binding Ig-like lectin and member of the immunoglobulin superfamily. Siglec-H is exclusively expressed by mouse natural interferon producing cells (IPCs), which play a major role in the first line defence against viruses, through the production of type I interferon (IFN), interleukin-12 (IL-12) and pro-inflammatory chemokines. Unlike other Siglecs, Siglec-H lacks a characteristic cytoplasmic ITIM (immunoreceptor tyrosine based inhibitory motif) domain, and instead relies upon its association with the adaptor protein DAP12 for signal transduction. Rat anti Mouse Siglec-H antibody, clone 440c inhibits IFN-alpha secretion by IPCs both in vitro and in vivo (Blasius et al. 2004). Purified bone marrow-derived IPCs and CpG oligodeoxynucleotide 1826. Lymph node cells from immunised Wistar/CRL rats were fused with cells of the Sp2/0 myeloma cell line. Blasius, A. et al. (2004) A cell-surface molecule selectively expressed on murine natural interferon-producing cells that blocks secretion of interferon-alpha. Blasius, A.L. et al. (2006) Siglec-H is an IPC-specific receptor that modulates type I IFN secretion through DAP12. Akk, A. et al. (2016) Neutrophil Extracellular Traps Enhance Early Inflammatory Response in Sendai Virus-Induced Asthma Phenotype. Liou, L.Y. et al. (2008) In vivo conversion of BM plasmacytoid DC into CD11b+ conventional DC during virus infection. Eur J Immunol. 38 (12): 3388-94.